Summer Sundays are perfect for a few things: being lazy, enjoying the sunshine, and trips to the countryside. Whilst I like being in London, I also like venturing out every now and again and enjoy some actual and real fresh air - you know, the non-polluted kind. So, yesterday Monsieur and I set of on our bikes (no, the irony with reference to the pollution isn't lost on me) into the Kent countryside. We stopped for a stroll in Chartwell and then moved on to this beautiful and traditional tea room. Having a traditional afternoon tea in the countryside is one of those immense pleasures that feel quite special as it's simply not something I indulge in on a regular basis. It's the kind of thing that makes me feel like I've stepped away from reality and back in time. It's comfortingly old-fashioned and for me one of the most British traditions. 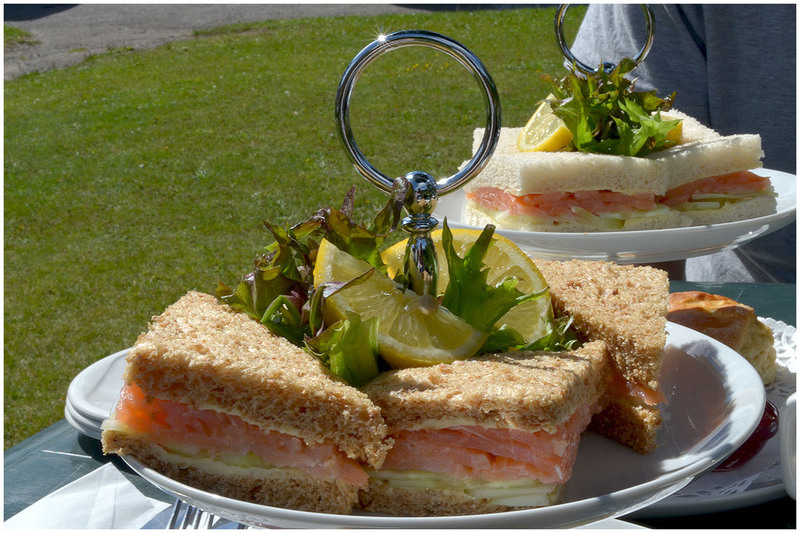 Sandwiches with smoked salmon and cucumber, scones with clotted cream and strawberry jam, cakes and tea. All beautifully presented and served outside on a green lawn in the warm sunshine. Surely one of the best things to enjoy on a Sunday? Now for something different: the cushion giveaway! Thank you so much for all your entires. I've counted 18 (and City Girl at Heart, yes, I've added the feedly follow) and have used the highly scientific method of a folded piece of paper for each from which Monsieur had the honour to pull one winner. And the winner is... Sue from Sweetpea Family. Congratulations! Please email me our address. Sorry to everybody else, I wish I had one for each of you.